Everyone knows that spring and summer are the best times to sell your home right? They say the fall real estate market is as dead as the leaves falling on your lawn. Well, that’s actually not the case at all, especially in the cure seller’s market. In a seller’s market, fall is the ideal season to sell your home. There’s not much competition out there, and there are plenty of buyers. The market is still very active. So if your house is on the market, or you’re considering selling, be glad! No one can deny that Autumn colors are beautiful. Home staging this time of year has many advantages. Let’s look at a few tips. This is a perfect way to get off on the right foot and make a great first impression. 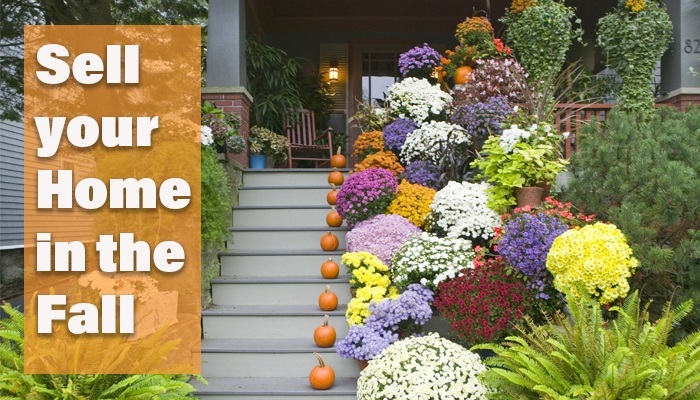 Try placing potted mums in seasonal colors by your front door, and add a simple fall- leaf wreath. A couple of pumpkins is a nice touch too, but, make sure they stay fresh. Top it off with a cute fall-themed doormat. Always make sure that you take care of any of the fall foliage before potential buyers arrive. And remember that while autumn appears to universally loved, Halloween is not quite as popular. While carved pumpkins and candy corn are okay, stay away from scary scenes, ghosts and skeletons. Not everyone wants to enter, or purchase a “haunted house “. Selling your home around Thanksgiving can be advantageous also.. Potential buyers will be thinking about gathering with family, and maybe even in their new home. Appeal to this by setting the table as if you’re expecting a large group for a delicious feast. Take out the china and crystal, place mats and chargers. Dress up the table with an Autumn runner, and accent the table with a fall-themed centerpiece. The outdoor changing leaves means changing colors. The beauty of Autumn is associated with warmer neutral colors, like deep reds, dark orange, and golden yellows. These colors are reminiscent of the glory of fall leaves. Add warmer tones around your house in various places, in your bathroom and kitchen towels, accent rugs, and even art. Always make sure they complement your existing color palette. Making your home appear comfortable and cozy is an added bonus for the cooler fall months. You can add some fluffy throws, blankets, and pillows to your couches and chairs. Use autumnal tones and textured fabrics like chenille or corduroy. Keep plenty of candles lit on the tables and counters. Plus, don’t forget to turn on extra lamps to keep the home bright as the days become shorter. Baking a pie or cookies may be a cliche home-selling tactic, but it can actually work, and there’s no better time to do bake than fall season. Scents of cinnamon, apple, and pumpkin spice not only make people feel at home, but it can help potential buyers picture themselves baking in their new kitchen! If you’re not a baker, add some scents around the home with spiced-scented candles, oil sticks, or potpourri.